IoT device management comprises of multiple operating systems and several varieties of communication methods and protocols targeted at conducting smooth functioning of smart devices. The service of IoT device management has become vital for the business sector in recent years due to the rising use of remote operation in a number of industries and the subsequent need to manage the operation of the devices. The global IoT device management market is expected to exhibit a robust 31.5% CAGR from 2017 to 2025. The importance of data analytics to the functioning and operation of a business has increased to a great extent in recent years. With the rising penetration of the internet, large volumes of data are being produced on a daily basis, which raises the need for progressive data management tools. As smart technology becomes popular these days, IoT devices have correspondingly become key producers of digital information. IoT device management systems allow players to collect, collate, and analyze these data, which has triggered rapid growth of the IoT device management market in recent years. On the basis of organization size, large enterprises held the dominant market share in the global IoT device management market in 2016. The increasing focus on research and development and application of innovative technologies in the day to day workflow, and higher capital base provide an opportunity for larger enterprises to adopt IoT device management systems to a greater extent to facilitate their operations, which is expected to drive the IoT device management market during the forecast period. Based on deployment, the IoT device management market is divided into three types, namely public cloud, private cloud, and others. Public cloud held the leading market share in 2016, as a growing number of enterprises opt for public cloud system so that the cost of data storage can be reduced to a great extent. Hence, increasing popularity of public cloud systems is likely to raise the demand for IoT device management over the forecast period. Rising use of remotely operable electronic devices in households could, however, lead to a significant rise in the demand for private cloud infrastructure in the coming years, potentially making it a leading contributor to the global IoT device management market. The IoT device management market is gaining demand from disparate industry verticals such as financial institutions, healthcare, manufacturing, transportation, and logistics. The key role played by digital operating mechanisms in these fields in modern times is likely to ensure steady demand from the IoT device management market. Regionally, North America held the dominant share in the global IoT device management market owing to greater concentration of smart homes and widespread adoption of smart technology in manufacturing and healthcare in this region. On the other hand, Asia Pacific is the fastest growing regional segment of the global IoT device management market and is likely to emerge to the fore in the coming years, with the regional market expected to exhibit a robust CAGR of 33.4% in the 2017-2025 forecast period. Leading players in the global IoT device management market are Robert Bosch GmbH, ARM Ltd., HP, Google, Intel Corporation, IBM Corporation, Oracle Corporation, Microsoft Corporation, Smith Micro Software, and SAP SE. This report covers the analysis and forecast of the IoT device management market on a global and regional level. The study provides historic data of 2016 along with forecast for the period between 2017 and 2025 based on revenue (US$ Bn). The study provides a decisive view of the IoT device management market by segmenting it based on organization sizes, deployment, application, solution, and regional demand. Application segments have been analyzed based on current trends and future potential. The market has been estimated from 2017 to 2025 in terms of revenue (US$ Bn). Regional segmentation includes the current and forecast demand for North America, Europe, Asia Pacific, Latin America, and the Middle East & Africa. These have been further sub-segmented into countries with relevance to the market. The segmentation also includes demand for individual applications in all regions. The study covers the drivers and restraints governing the dynamics of the market along with their impact on demand during the forecast period. Additionally, the report includes potential opportunities in the IoT device management market on the global and regional level. In this report, we have also incorporated latest market trend of global IoT device management market which helps to analyze future prospective demand of this market. In this report, such demand generating factors help to determine future market prospect of IoT device management market. Certain opportunity factors have also been incorporated in this report that are helpful to measure the target growth rate of this market over the forecast period. 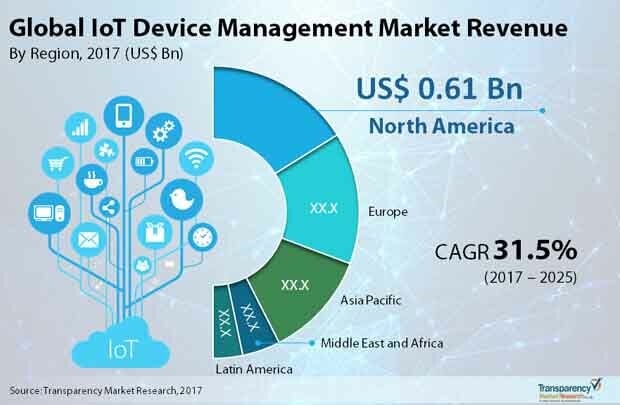 Hence, market dynamics is one of the important sections in this report that helps to measure the future growth rate of IoT device management market during the forecast period. The study encompasses market attractiveness analysis, wherein application segments have been benchmarked based on their market size, growth rate, and general attractiveness for future growth. This study also includes market attractiveness on the basis of organization sizes, deployment and solution. Regional market attractiveness analysis on the basis of each segment helps to analyze the most prospective segment in each region. The report provides the size of the IoT device management market in 2016 and the forecast for the next nine years up to 2025. The size of the global IoT device management market is provided in terms of revenue. Market revenue for regions is in US$ Bn. The market size and forecast for each product segment is provided in the context of global and regional markets. Numbers provided in this report are derived based on demand generated from different application segments. Demand for IoT device management has been derived by analyzing the global and regional demand for IoT device management in each application segment. The global IoT device management market has been analyzed based on projected demand. Market data for each segment is based on corresponding revenues. Forecasts have been based on the expected demand from IoT device management. We have used the top-down approach to estimate the global IoT device management market, split into regions. The application split of the market has been derived using a top-down approach for each regional market separately, with the global product type segment split being an integration of regional estimates. Companies were considered for the market share analysis based on their product portfolio, revenue, and manufacturing capacity. In the absence of specific data related to the sales of IoT device management of several privately held companies, calculated assumptions have been made in view of the company’s product portfolio and regional presence along with the demand for products in its portfolio.